The M100 CDMA485 for the Verizon Network is the perfect solution for M2M applications facing tough environmental conditions and extended lifetime requirements. This compact and intelligent modem running Open AT Application Framework supports specific protocols and accessories specifically developed by Maestro to ease integration with industrial equipment such as electricity meters, programmable logic controllers, lifts and alarm systems. 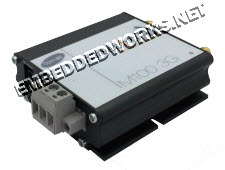 Rather than having the standard RS-232 connection found in many modems, this unit features a RS485 interface with a terminal block, for a more robust, industrial solution.The M100 CDMA485 is fully type approved in CDMA or 3G and ready for global deployment. RF Connector ext cellular antenna, SMA female (X2). All other antennas internal.